The apartment sleeps 4 and is furnished to a very high standard. The master bedroom has an en-suite shower, family bathroom has a whirlpool bath and separate shower. There is a fully equipped granite kitchen with double oven, hob, microwave, and fridge/freezer. There is Plasma TVs in lounge with DVD and Sky package. There is a Plasma TV in master and DVD/TV in bedroom 2. This is a large apartment with feature high ceilings in the lounge and wide sea views. There is a separate dining area with granite top table. The bedrooms are an excellent size and would suit either a family or 2 couples. The apartment is accessed from the parking space behind the building via approx 9 steps. However access is also available from the street at the front of the property via a couple of steps and so would possibly be suitable for someone who is moderately mobile and can walk a short distance. Note rear parking space is 1.8m wide but there is an additional parking space for a large car close by. My husband and I live in Cheshire, UK. We love Cornwall and so we decided to buy a holiday home with a view to retiring down there in the future. We let the property out when we were not using it and maintain it to a high standard because it is our future home. When we had decided to buy in Cornwall, we spent some happy times touring around and viewing properties to purchase. When we saw this apartment we knew it was the one for us. A lot of apartments we viewed were to small to become a permanent home. This apartment is the ground floor of a converted hotel and has large rooms with high ceilings so plenty of space as a potential future place to live and to relax on holiday. We feel that St Ives is the best place in Cornwall, with lovely beaches, the historic harbour and fantastic restaurants. It is wonderful to wander around the old town exploring the little shops and watching artists at work. The apartment has a fantastic view over the St Ives Bay towards Godrevy and is unusual in that it has a large terrace from where to sit, admire the view and watch the world go by. We furnished the apartment for our own use and therefore the furnishings are high quality with leather suites and granite top tables. We have 2 car parking spaces, one directly behind the property (1.8m wide) and another large space in a private car park located very close to the apartment. Ensuite with shaver point, heated towel rail, large shower. Main bathroom has whirlpool bath and separate shower cubicle, shaver point and heated rail, Master bathroom is adjacent to bedroom 2 and so ideal for two couples. Please bring your own towels. Spacious living room with high ceilings. Leather reclining 3-seater, 2-seater and recliner chair. Large plasma screen with Sky TV and DVD player. Fireplace, lovely sea views. Telescope. Separate dining area with granite table. Internet. Basic Sky TV package and Freeview. Large terrace with seating and table. Fabulous view across St Ives bay and the harbour. Nearest golf course is in Lelant - 2 miles. Notes on accommodation: Central heating provided. Walk to beaches, restaurants and shops. Local shops nearby. Tesco 10 mins drive. New ASDA superstore in Hayle. Outside: There is a large terrace with table and chairs provided. There are sea views from the terrace across St Ives Bay to Hayle Towans and Godrevry Lighthouse. Ideal for al fresco dining. Note rear parking space is 1.8m wide but there will be an additional parking space for a large car in a private car park close by. Utility Room: Wash dryer, central heating boiler. Cleaning / Towels / Linen / Maid service: Bed linen is provided but please bring your own towels. The apartment is beautifully situated, well furnished and the kitchen has all the utensils one could possibly need. I find that some apartments have barely any utensils, but this apartment is spot on. The views are lovely and I found it very quiet. Big, spacious and nicely decorated. I would highly recommend. Thank you very much for your nice comments. I am glad you enjoyed it and hope you will choose our apartment should you come back to St Ives. We've stayed in rental properties all over Europe and this is one of our favorites. It is well laid out and stylishly decorated, with spacious rooms, comfortable furniture, big well-equipped kitchen, nice bathrooms, wonderful front terrace, good TV and WiFi connections. It would be perfect for two couples, with the bedrooms at opposite ends of the apartment and each with its own bathroom. We were determined not to drive on this trip, so we chose St. Ives because the train comes there and will take you to other interesting towns such as Penzance and Falmouth as day trips. Scenery in the area is gorgeous. St. Ives is set up to accommodate tourists, with numerous galleries of local art, good pubs & coffee shops and a lively waterfront, and is very crowded when the weather is nice, like Bar Harbor or Key West. The apartment is a reasonable walking distance from the train station and the heart of town, but it's a pretty steep climb up the hill, so if you don't have a car, take a taxi when you arrive rather than schlepping your bags up there. We stayed for five nights and could have enjoyed another week in this lovely location. Thank you for your lovely review. We are glad you had a good time and enjoyed your stay at our property. Fantastic break in a lovely flat. The pictures don't do justice to the size of the rooms and the view is fabulous. We would love to come back and stay again. Thank you very much for your nice comments. We hope you come and visit again soon. Everything we needed for a super stay in St Ives over the New Year. Excellent property and location for town and beaches. Loads of space for 4 of us and never felt cramped. 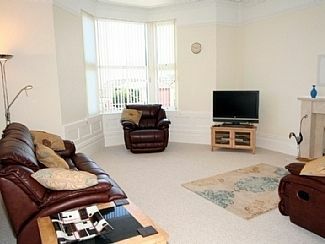 The photographs don't do the size of the rooms justice, very large living room and two good sized double bedrooms. The kitchen and bathroom are nicely finished. Location of apartment is great with 3 mins walk to the town centre, and sits on the hill with the benefit of the sea views. 10 mins walk to Porthminster beach and St Ives historic harbour. Nearest airport in Newquay (1 hour drive). St Ives Station is 5 minutes walk from the apartment. 10 minutes walk to town. It is possible to catch the Tregenna Car Park Bus back to the apartment if necessary. £25 booking fee applies. We manage our property through a local agent on the high street in St Ives so if you want to make a reservation, I will provide there telephone number and you can make a secure booking through them. They will arrange key collection and provide support during your stay. Short breaks may be available outside of peak times. Changeover Day: Saturday changeover.